For a casual brunch following St. Paddy’s Day, I opted to configure some of my fabulous corned beef hash into a riff on Scotch Eggs. 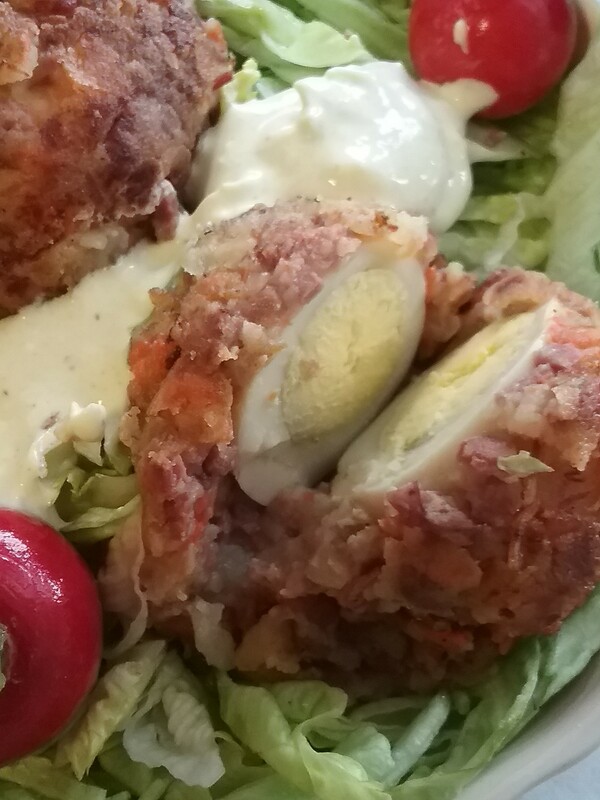 Often eaten as a cold snack, Scotch Eggs are hard cooked eggs wrapped in sausage and deep fried. As such, my version included just enough of the corned beef hash to tidily encase a hard cooked egg. It was then treated to a gentle sauté in a thin layer of vegetable oil until hot and crispy. Since I had hard cooked eggs ready to go, this treat took no time at all. My yolks were more cooked than I normally prefer— the perfect enhancement would be a slightly moist yolk. Once I had a grip on the egg preparation this was a fairly effortless undertaking. The lively plates consisted of the highly entertaining Irish Scotch Eggs along with a mild mustard sauce, pickled onions, radishes, sharp cheddar cheese and warm soda bread slathered with cranberry apple jam. Irish Eggs, Scotch Eggs, Irish-Scotch Eggs… enjoy and call them whatever makes you happy! Heat a skillet with oil over medium-high heat. Place flour in wide bowl and lightly dust the egg with flour. Mound hash in palm of hand and make an egg-sized indentation in the center. Insert the hard cooked egg into the center and mold the hash around the egg to completely encase it. Lightly moisten hands with water if it becomes sticky. Carefully dust the exterior with flour and place egg in hot pan. As the surface begins to take on color, roll it over slightly with spatula, continue until entire surface is crisp and lightly browned, 7 to 10 minutes. Serve with accompaniments of choice. Light Mustard Sauce: combine ¼ cup sour cream and ¼ cup mayonnaise, blend in 1 tablespoon deli mustard, or to taste.